I’m just going to dive in + tell y’all, this cake is AMAZING. First, let me explain the name – it’s called a Quadruple Chocolate Cake because it has 4 different sources of chocolate – a chocolate-based cake, with chocolate morsels mixed throughout, topped with a cocoa syrup, + even more flaked chocolate on top of that. SWOON. I first ate this cake a few months back, when my friend Alexandra made it for a girls’ night party. It was one of the most chocolatey, rich, decadent cakes I’d ever eaten + I couldn’t stop going back for more bites. So, when my chocolate-loving husband had a birthday last week + he requested, simply, “something really chocolatey” for his birthday dessert, I knew I had to give this cake a try. And surprisingly, it was really easy to make, coming together quickly + easily. 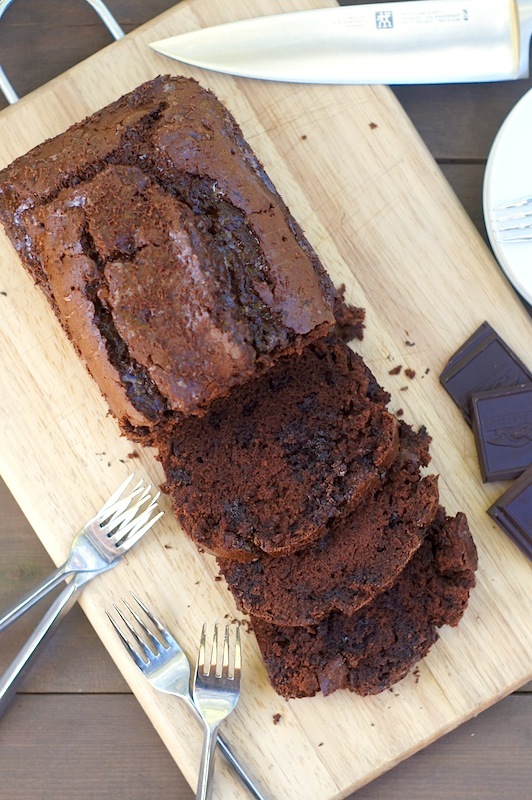 The end result is a super rich, sticky, sweet, perfectly chocolatey loaf cake. It is amazing for dessert, topped with ice cream + hot sauce, or as a mid-afternoon pick-me-up, with a cup of tea. And if you love chocolate as much as we do, you *must* put it on your to-make-soon list – you will love it! Take whatever you need out of the fridge so that all ingredients can come to room temperature. Preheat the oven to gas mark 325 degrees F, putting in a baking sheet as you do so, and line a 2lb loaf tin (mine measures 9.5″ x 4.5″ x 3″ deep and the cooking times are based on that) with greased foil – making sure there are no tears – and leave an overhang all round. Or use a silicon tin. Put the flour, baking soda, cocoa, sugar, butter, eggs, vanilla + sour cream into the processor and process till a smooth, satiny brown batter. Scrape down with a rubber spatula and process again while pouring the boiling water down the funnel. Switch it off then remove the lid and the well-scraped double-bladed knife and, still using your rubber spatula, stir in the chocolate chips or morsels. Scrape and pour this beautiful batter into the prepared loaf tin and slide into the oven, cooking for about 1 hour. When it’s ready, the loaf will be risen and split down the middle and a cake-tester, or a fine skewer, will pretty well come out clean. But this is a damp cake so don’t be alarmed at a bit of stickiness in evidence; rather, greet it. Not long before the cake is due out of the oven – say when it’s had about 45-50 minutes – put the syrup ingredients of cocoa, water and sugar into a small saucepan and boil for 5 minutes. You may find it needs a little longer: what you want is a reduced liquid, that’s to say a syrup, though I often take it a little further, so that the sugar caramelizes and the syrup has a really dark, smokey chocolate intensity. Take the cake out of the oven and sit it on a cooling rack and, still in its tin, pierce here and there with a cake tester. Then pour the syrup as evenly as possible, which is not very, over the surface of the cake. It will run to the sides of the tin, but some will have been absorbed in the middle. Let the cake become completely cold and then slip out of its tin, removing the foil as you do so. Sit on an oblong or other plate. Now take your bar of chocolate, wrapped in foil if you haven’t got much of its wrapper left, and cut with a heavy sharp knife, so that it splinters and flakes and falls in slices of varying thickness and thinness. I’ve specified a weight for the chocolate flakes, but really go by eye: when you think you’ve got enough to scatter over the top of the loafcake, stop slicing. Sprinkle these chocolate splinters over the top of the sticky surface of the cake. this is chocolate lovers dream come true! How embarrassing that I didn’t even recognize this cake! I remember, now, making it. But your riff [and photos]? DEEEEEELICIOUS. Imma have to recreate *this* very recipe next time. Looks, so so good! You cannot go wrong with chocolate in my mind. Adding for kinds to one baked good is right up my alley! Lovely! WOW! I am in chocolate heaven! Oh my word. I could EASILY put away half this cake on my own. This looks amazing! My birthday is next month – can I place an order? This looks amazing – pinning and making this one for sure! Oh that cake! I remember it, it was for the Bachelor finale! It was delish and yours looks amazing, too! Yes! I knew it was for some girls’ night event – the Bachelor finale, of course! =) Trashy tv + delish food + excellent friends = winning. As a full blown chocolaholic, this recipe is calling my name. my kind of cake! I love what sour cream does in cake batter too! Definitely pulling this out next time I need a chocolate fix! There is absolutely nothing better than chocolate on top of chocolate on top of chocolate on top of chocolate. This is my dream cake! Amy, you had me at quadruple chocolate. 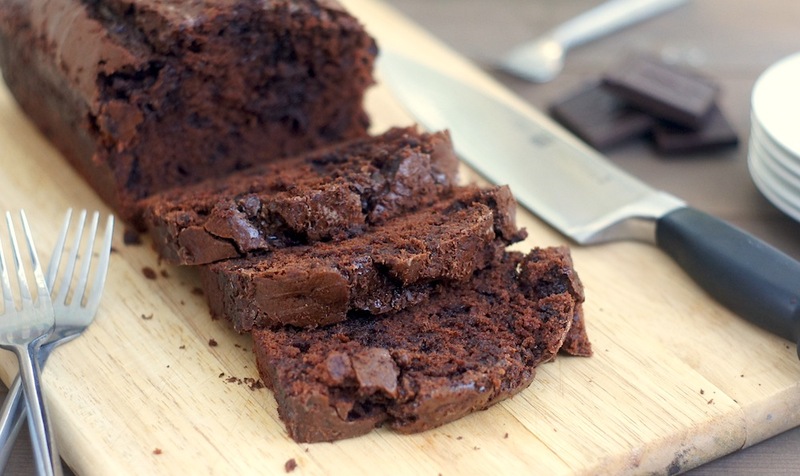 This loaf is absolutely amazing and oh so chocolately. What a lucky husband. Pinned. I love this loaf! So much awesome chocolate in there! Love love love! I am a choco-holic. This looks delicious! Oh, I have 4 strong reasons to love this cake. I need to try this! Wow! A glass of Prosecco, and I’m in! This looks great. Years ago, and I do mean MANY years ago, a dear friend asked me if I had ever found a good recipe for what was essentially a chocolate pound cake. Over time, she and I tried many recipes. They were all either too heavy, too sweet, not chocolatey enough – you get the picture. This one, with the addition of sour cream and the use of cocoa and chips, coupled with the chocolate is, I bet, the answer. Thanks! I’m having a touch of chocolate-induced arrythmia just looking at the pics. Wow! That cake looks unbelievable! Next time I’m looking for a chocolate overload, I’ll know where to start. whoa, 4 kinds of chocolate?! i definitely need to give this cake a go! yum! This looks fantastic! I love quick breads and haven’t made a chocolate one in forever! So much chocolate goodness! I can taste the intensity through the screen! Thank you for sharing. So glad to see a post from you! This cake looks so awesome — so, so chocolaty! Chocolate is one of my most favorite things, so I need to give this cake a try. Maybe I can convince someone to make it for my birthday?! Quadruple chocolate?! I’m in heaven! I can have this for breakfast, lunch and dinner. A big glass of milk is a must. 😉 Have a great week Amy!